Sign up to receive our Newsletters Today! Don't miss out on the most up to date adventures aboard Snappa Charters. Our first day of the season started out the way no one wants their season to begin. Yep, we struck out! But after that, it was smooth sailing for the remainder of the season. 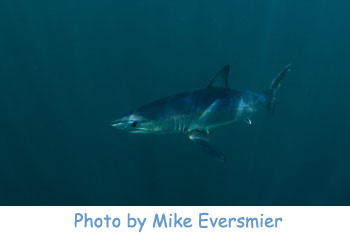 During the last week of June we found the first mako of the season. We also saw about 4 to 5 blue sharks on each dive. The two most common questions I hear are, “What is the best month to dive and when will I see the most sharks”? The month of June answers both questions. It is the calmest month for diving and you will probably see the most blue sharks. In addition, you may see schools of dolphins, whales, ocean sun fish and sea turtles. The second set of shark dives took place near the middle of August. We only saw one mako but we had some heavy weight blue sharks. The visibility is usually about 40 ft. with the water temperature about 8 degrees warmer than the month of June. The last set of shark dives for the season took place between August 26th and September 4th. This is the most consistent time of year for the best visibility, warm water, and variety of species. The wind blew on a few of the days canceling some trips, which is to be expected at this time of year. On the days we did get out we had one day that produced 3 makos. On another day we saw a whale and some dolphin and a mahi mahi. Another group saw 2 makos on the same day. Finally, one group saw over 50 porpoises, 4 blue sharks, one whale and a mahi mahi. So you never really know what is going to show up. At the end of a day, I like to tag a few of the sharks for research. This year we tagged 36 sharks bringing the total number of tagged sharks from Snappa to 2538. 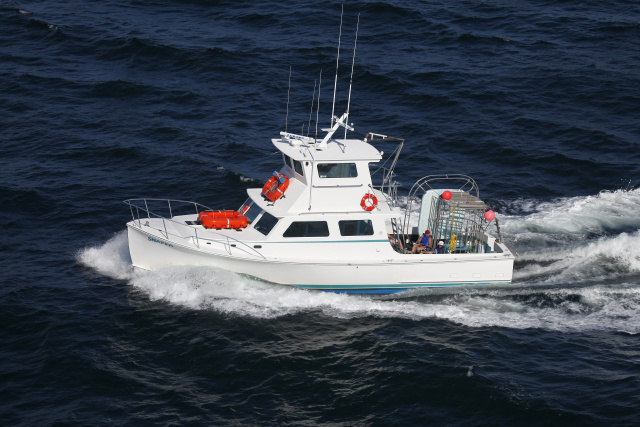 Our effort has rewarded us with shark recaptures from as far away as the Azores, Africa, and South America. If you would like to follow our last satellite tagged mako shark in real time, go to my website at www.snappacharters.com and click on my shark tagging page. Follow the directions spelled out. The shark is sponsored by Sea World 3. As of this date in late February, the mako shark has traveled over 5,250 miles and is located approximately 400 miles southeast of Nova Scotia and Newfoundland. 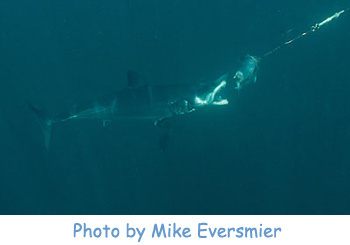 Our other two mako sharks that were tagged with satellite tags were sponsored by Show Management and Yacht Chandlers 2. They are no longer active but you can follow their route and track their distance traveled. As you know, a lot of my business is driven by word of mouth and recommendations. Did you read an online review to find us? We read them, and so do other customers. That’s why we’d love it if you take a few moments to review your experience on our Yelp or Facebook page.